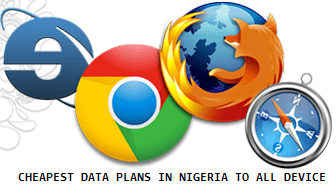 I have now updated this page with the Current cheapest Mtn, Glo, Etisalat airtel data plans for PC, android devices, everything has been changing to better since all the Nigerian mobile telecommunications decided to reduce their data plan price, I decided to update this page as the price and data allowances changes. Note: All Nigerian mobile telecommunication no longer use any special data plan designed for Android, iPhone or Windows but for all device except blackberry device. Now i will list 2017 cheapest Mtn, Glo, Etisalat airtel data plans for PC, android devices that you can use for your personal and business internet needs. What do i meant by "rate of data Consumption" it means that Android consumes more MB than every other OS, Example it can take a Symbian Nokia phones days or weeks to consume 50mb if yu don't use it to download but with Android Mobile Device it can only take few hours or let say 2 days to finish the 50mb. The Good news now is that MTN, GLO, ETISALAT and AIRTEL has taken a bold step by providing an affordable and sustainable that plan/bundles for every device and Android users in Nigeria. Below are the new 2017 cheapest Mtn, Glo, Etisalat airtel data plans for PC, Android, iPhone and windows devices to subscribe to any of your desired plans. No doubt MTN is the big boy in the game as they have a variety of data plans ranging from daily, weekly, monthly, 60 Days and Quarterly Plan to choose from. Glo is now the most affordable and reliable internet data provider in Nigeria and an indigenous telecommunications company, it has a wide coverage with superb internet speed, most areas it covers has 3G services, and as an indigenous company. Etisalat is an UAE based telecommunications service provider, currently in 18 countries, there services in Nigeria is a bit good, as most people who use data plan from this company will confess the speed they offer is incomparable with its counterparts, even if you have EDGE service you might still be able to get top speed almost comparable to 3G speed from other service providers. Airtel is one of the leading mobile network operators in Nigeria that offers affordable and fast 3G internet data bundle plan for Android and other device users in Nigeria, their Android data plans as follows. Enjoy and remember ask question if you have any. Wow i really spent a lot of time reading this and i must congratulate you for a job well done, though i am still thinking on the best network to go for.